To request a Douglas-Hart program at your library, please call, email, or use the online request form. When scheduling, please have multiple dates in mind, as the program availability fills quickly. Program price depends on the distance of your library from the Douglas-Hart Nature Center. Discounts are available for multiple programs and for partnering with nearby libraries. Contact the Nature Center for details. All programs feature a live animal to meet and touch. 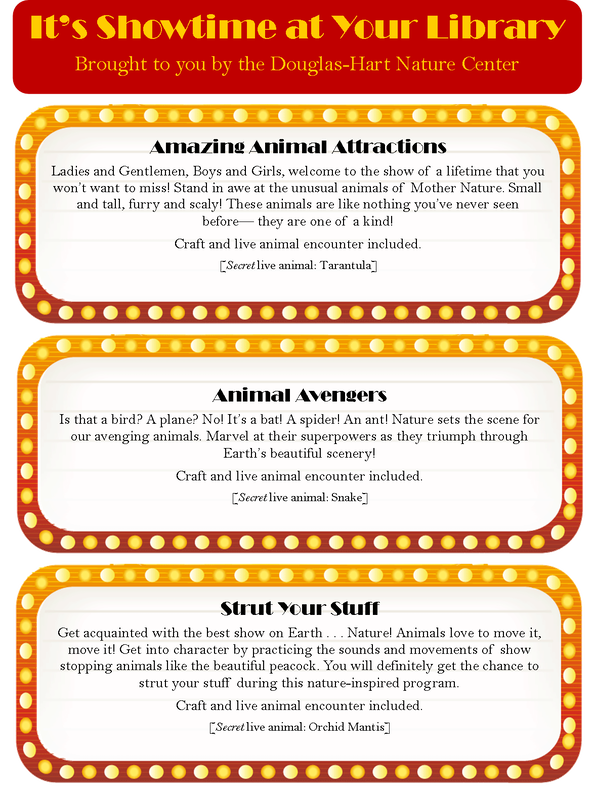 The animal for each program is listed in the program description, but shhhhhh! We try to keep it a surprise for the kids! These program are designed for school-aged children. Our educators will adjust each program for the ages present. Our educators can adjust to your space. We request you provide a table at the front of the space. Audience may be seated on the floor, in chairs, or at tables. Programs are 50-60 minutes, but can be shortened by request.